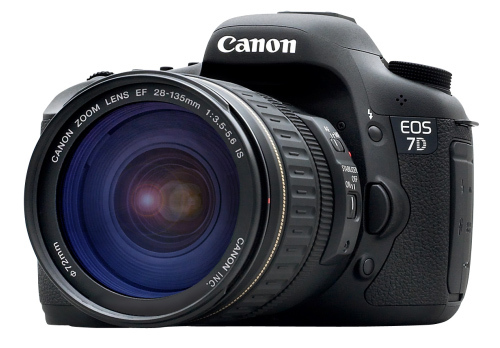 With a host of brand new features designed to enhance every facet of the photographic process, from still images to video, the new EOS 7D represents a whole new class of camera. Made to be the tool of choice for serious photographers and semi-professionals, the EOS 7D features an all-new 18.0 Megapixel APS-C size CMOS sensor and Dual DIGIC 4 Image Processors, capturing tremendous images at up to ISO 12800 and speeds of up to 8 fps. The EOS 7D has a new all cross-type 19-point AF system with improved AI Servo II AF subject tracking and user-selectable AF area selection modes for sharp focus no matter the situation. The EOS 7D's Intelligent Viewfinder, an entirely newly-designed technology, provides 100% coverage and displays user-selected AF modes as well as a spot metering circle and on demand grid lines. New iFCL Metering with 63-zone dual-layer metering system uses both focus and color information to provide accurate exposure even in difficult lighting. The EOS 7D also captures Full HD video at 30p (29.97 fps), 24p (23.976 fps) and 25p with an array of manual controls, including manual exposure during movie shooting and ISO speed selection. The pinnacle in Canon's constant-aperture telephoto zoom lenses, the EF 70-200mm f/2.8L IS USM Telephoto Zoom Lens is an incredible optic with robust design and tack sharp results. Second-generation Image Stabilization responds in as little as 0.5 seconds, while providing up to three stops stabilization that as hand-holdable as a normal lens. IS now automatically deactivates when on a tripod by sensing non-movement of the camera and lens, also conserving battery power. An entirely new optical formula produces images that are superior to even its highly regarded predecessor, the EF 70-200mm f/2.8 L, despite having more reflective surfaces within the lens. The Canon EF 85mm f/1.2L USM Autofocus Lens is a fast lens that delivers superb optical performance. A maximum aperture of f/1.2 makes it the professional's choice for shooting without flash in low light conditions. The large aperture also provides fine control over depth of field for compelling portrait photography. Retaining the impressive optical performance and large aperture of its predecessor, this medium telephoto lens has been improved with a Ring-type USM, high-speed CPU and optimized algorithms to achieve an autofocus speed approximately 1.8x faster than the original. The high-speed AF and circular aperture create a shallow depth-of-field that brings attention to the subject and blurs the background, which is ideal for portraits and weddings. The Canon EF 28-135mm f/3.5-5.6 IS Lens is a compact and lightweight standard zoom lens that offers superior optical performance, plus a built-in Image Stabilizer. The IS system reduces the possibility of blurred photographs caused by camera shake, which allows for handheld photography in comparatively dim light without a flash or tripod. At the wide angle end of the zoom range, the equivalent shutter speed gain is approximately 1.5 stops while at the telephoto end, it is approximately 2 stops. This lens retains the optical capability of the highly popular Canon EF lens series, with a refined exterior design, including ring-type USM drive for silent, high-speed auto focusing plus full-time manual focusing. It is an excellent zoom lens for everyday use. Highly popular wide angle lens featuring a large aperture. Good for casual snapshots as well as perspective shots. Floating rear focusing system corrects astigmatism and gives high contrast and sharp delineation. The Canon EF 24mm f/1.4L USM lens is a venerable wide-angle prime lens that provides sharpness and impressive performance at all settings. Its large maximum aperture of f/1.4 allows for superb low-light photographs, and its circular aperture and narrow depth of field provide pleasing background blur. It is the ideal tool for photojournalists, landscape and event photographers, and anyone who enjoys taking images from a wider perspective. Ultra-wide-angle lens for serious applications. Easy to hold and carry at 0.89 lb. Floating rear focusing system gives sharp images at all subject distances. Zoom in on a favorite subject from a distance with the Canon EF 200mm telephoto lens. Offering a long focal length that lets you effectively compress the distance between the subject and camera, the lens lets you easily capture the details and feeling of a far-off scene. The lens is distinguished by two ultra-low-dispersion (UD) glass elements and a rear focusing system to correct aberrations, producing extremely sharp images. The lens also offers a natural-looking background blur and comes with a dedicated, detachable hood. While an excellent ultra-wide zoom lens for film SLR cameras, the Canon EF 17-40mm f/4L USM Lens is especially well suited for use with EOS digital SLR cameras, which usually have an imaging sensor size smaller than the 35mm format. When used with such digital SLR cameras, the 17-40mm focal length range gives an angle of view approximately equivalent to that of a 27-64mm lens upon 35mm cameras, making it an ideal medium-aperture standard zoom lens. The EF 17-40mm f/4L USM, like all of the Canon "L" lenses, delivers optical performance equal to similar fixed focal length lenses, with silent, high-speed focusing. Distortions and aberrations are remarkably small for a lens of such amazing capability. It combines 1 high-precision molded glass aspherical lens and 2 replica aspherical lenses to achieve the extended zoom range, while also correcting for common aberrations that arise during zooming. A Super UD (ultra-low dispersion) glass element minimizes the chromatic aberration of magnification which tends to occur with wide-angle lenses, to help eliminate color bleed along the edges of the subject and achieve high image contrast and resolution. The 17-40's minimum focusing distance is just 11" (28cm) throughout its entire range of focal lengths, which makes it very useful for close-up work. All of the focusing and zooming action is done internally, with no changes of the size of the lens. It only uses lead-free optics to help the environment, and features a circular diaphragm for improved background blur. The housing is water and dust resistant to help ensure reliable performance for both professionals and enthusiasts. Like many "L" lenses, it uses 77mm filters, but also has a rear gelatin filter slot behind the lens mount. The Canon EF 16-35mm f/2.8L USM Autofocus Lens is a high performance, water-resistant, and ultra wide-angle L-series lens. The optical design has been improved to offer better edge-to-edge image quality. In addition, it features 3 high-precision aspherical lens elements, each of a different type: ground, replica and GMo. Improved AF algorithms will help the lens to focus faster and quieter. Fisheye lens with a 180 angle of view for unique and intriguing effects. The wide depth of field makes it even more interesting. The short minimum focusing distance of 8 in. (20 cm) gives new meaning to close-up shots. The lens has a fixed petal-type hood and a gelatin filter holder at the rear. The Canon EF 14mm f/2.8L USM Autofocus Lens is a bright lens that provides an ultra wide-angle view, and has the shortest focal length in the line-up of L series lenses. Its diagonal angle of view is an impressive 114 - anything larger would be a fisheye lens. The 14mm f/2.8L II USM lens uses a rear focusing system, high-speed CPU, and a powerful ring-type USM with revised electronics for faster, more responsive AF. This wide aperture lens is the ideal choice for architectural, corporate, or other pro-level photography. This is the older style macro lens. It does not have image stabilization. One of the finest telephoto zoom lenses in the EF line, comparable to a single focal length lens. It has four UD-glass elements to correct chromatic aberrations. The newly-designed multiple zoom groups for inner focusing bring high image quality throughout the entire zooming range. This is the Non IS (Image Stabilizer) version. The standard lens for many professional sports and nature photographers. The latest image-stabilized version of the 400mm f/2.8L is the best yet, with better handling, lighter weight and the world's fastest AF speed among 400mm f/2.8 lenses. Durability and weather resistance are world class. A complete redesign of optics has resulted in Canon's best image quality ever in a 400mm lens. The EF 50mm f/1.2L USM is a peerless new standard lens featuring an ultra-large aperture for a narrow depth of field and soft background blur so loved by photographers everywhere. The EF 50mm f/1.2L USM is suitable for any shooting situation; its lens coating and construction are optimized to minimize the ghosting and flare that frequently occurs when lenses are used with digital cameras. The H4n features onboard true X/Y stereo microphones to pick up clear, natural sound without phase shifting. The mics can be rotated to select a 90 or 120 recording pattern for terrific versatility. The digitally-controlled preamp, combined with the high-quality microphones, allows you to capture Linear PCM audio at rates up to 24-bit/96kHz. The recorder captures audio to SD or SDHC cards with capacities up to 32GB. A USB 2.0 port allows you to quickly transfer files to a Mac or PC, or use the H4n as a live audio interface. For connecting your own microphones or instruments, the H4n features XLR/TRS combo input jacks with phantom capability. A 3.5mm line output is provided, and a reference speaker is built-in for quickly reviewing your recordings. The unit operates on a pair of standard AA batteries, and features a Stamina mode to provide up to 11 hours of continuous recording at 16-bit/44.1kHz. The EF 300mm f/2.8L IS USM sets new standards in performance and versatility with its lighter weight, better balance, and particularly its new Image Stabilization. In addition, the tripod collar can be removed for even more weight reduction and hand-holding comfort. - Fluorite and UD elements eliminate secondary spectrum chromatic aberration. - AF speed is the fastest in the world. - Full-time manual focus override. - AF Stop function shuts off autofocus when an obstruction appears. - Dust and moisture resistance made exceptional by magnesium alloy lens barrel and new rear gasket at lens mount. - Two-stage image stabilization; dual-axis camera shake correction or vertical axis only (for panning). - Focus preset function allows for returning to a specifically set focus by turning a ring in front of the focus ring. Older, Non IS, Non USM lens. The high-performance L-series EF 300mm super-telephoto lens is a terrific choice for sports photographers and other long-distance users. Sports action requires a fast shutter speed and a long focal length. This lens easily complies thanks to its large maximum aperture-- which supports a faster shutter speed-- and its 300mm length. This is the older, Non IS (Image Stabilizer) lens. The Canon 85mm f/1.8 EF USM Autofocus Lens is a highly practical medium telephoto lens with superb delineation and portability. Images are sharp and clear at all apertures. Through computer simulations, the lens has been designed to give beautiful background blur. Since the front lens group does not rotate during focusing, special filter effects are not affected. Standard lens featuring superb quality and portability. Two high-refraction lens elements and new Gaussian optics eliminate astigmatism and suppress astigmatic difference. Crisp images with little flare are obtained even at the maximum aperture. Comes with Hood. This fast wide angle lens with a minimum focusing distance of only 0.8' allows you to approach the subject closer and still obtain a more natural wide angle effect. Excellent background blur for portraits is obtainable. The superior-quality Canon EF 35mm f/1.4L USM Wide-Angle Autofocus Lens features a brilliant maximum aperture of f/1.4, the largest in its class, along with the superior natural image quality of Canon L-series lenses. An advanced floating mechanism and a ground and polished aspherical lens element achieve extremely sharp, distortion free pictures from infinity to its closest shooting distance of 1.0'/0.3 m. With ring USM-powered rear focus, autofocus is stealthy and swift. A wide focusing ring provides comfortable manual focus, and the filter ring remains stationary for ease of use with polarizers and other special effects filters. This highly portable wide-angle lens has a good price-to-performance ratio. Its light weight of 185g makes it ideal as your standard wide-angle lens. The high-precision aspherical lens minimizes distortion and other aberrations for sharp images with high contrast. With the large maximum aperture, excellent background blur is possible with fast shutter speeds. The aspherical lens element makes the lens compact and corrects spherical aberrations. The image is sharp even at the edges. For discerning architectural photographers, there is great need for wide angle lenses. Tilt and shift movements, features normally found on large format cameras, can be bestowed upon a smaller format of camera with a lens such as this wide Canon 24mm f/3.5L TS-E Lens. Being a Canon "L" lens, by definition it is a premium Canon optic. The 24mm TS-E has several distinct elements that make it stand apart from more common glass. Firstly, designers integrated a set of physical controls that allows users to rotate the direction of the tilt and shift independently of one another. Secondly, there is +/-8.5 of tilt and +/-12mm of shift that gives photographers ample ability to correct for perspective when taking images of interior or exterior spaces, and landscapes. The DXA-5D provides an easy way to connect professional microphones and other audio gear to the Canon 5D Mark II camera. It is now possible to capture professional sound with control and monitoring ability. The DXA-5D features dual transformer-balanced XLR inputs with phantom power and built-in level meters. In addition, the built-in headphone jack allows the user to monitor the audio - a feature missing on this camera. The trim controls allow the user to dial in the proper signal levels for optimum recording quality. Most importantly, is the unique AGC Disable function which was the most sought after feature by users of this camera. The AGC Disable circuit is activated by a switch which controls the wild swings of the Auto Gain Control in the camera to reduce the hiss generated by the preamplifiers during quiet moments of recording. It works by sending a high frequency inaudible tone to the left channel of the camera. This feature greatly decreases the camera noise which has always been a problem in the past.